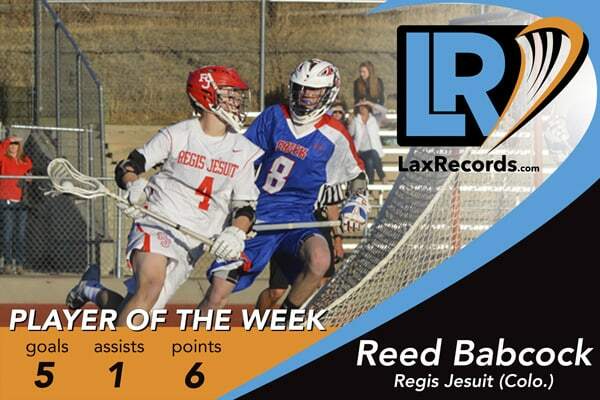 Reed Babcock is the LaxRecords.com Player of the Week for March 20, 2017. Photo courtesy Margaret Babcock. Babcock helped Regis Jesuit overcome a 3-1 deficit against rival Cherry Creek (Colo.) on March 15. The Denver commit scored five goals and dished out one assist in the 14-11 victory, which was a rematch of the 2016 state semifinal game. Babcock got his first goal with the Raiders down 5-2 in the second quarter. He scored another to bring the score to 5-4 then assisted on Nick Ringhofer’s goal to tie the score at 5-5 before halftime. The sophomore’s third goal, and first in the second half, extended Regis Jesuit’s lead to 9-7. He added another in the third and scored his final goal to extend the lead to 12-7 in the fourth quarter. St. Geme scored four goals, including the game-winner in an 11-10 win over Gonzaga (D.C.) on Friday. St. Geme leads the Wildcats with 12 goals this season. 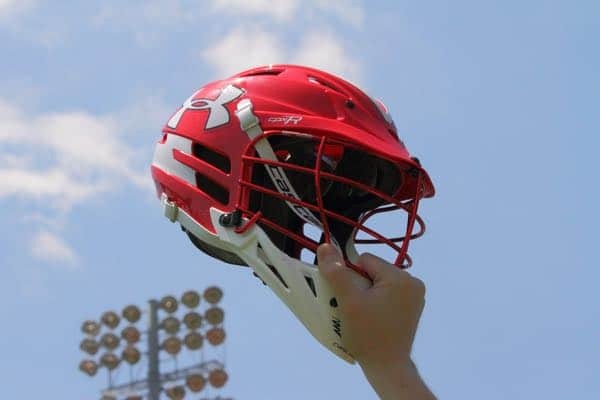 The senior filled the stat book in a loss against Thompson Valley, winning 13 of 19 faceoffs, picking up 10 ground balls and scoring five points. Hancock scored three goals and had two assists in the 9-8 loss. Harvey helped the Warriors to a big win over Mountain Vista (Colo.) on Friday. The junior won 17 of 27 faceoffs, had 10 ground balls and had one assist in the 15-14 victory. Krampf scored four goals and had one assist as St. Mary’s opened the year with a 12-7 win over St. Mary’s Ryken (Leonardtown, Md.) on March 10. Krampf added four more goals in the Saints second game of the year, a 12-3 win over Saints Peter & Paul (Easton, Md.). He finished the week with two goals in a 9-7 win over Springside Chestnut Hill (Philadelphia, Pa.) on Saturday. Larkin scored six points, including four goals and two assists as Green Hope defeated state power Apex (N.C.) 11-7. The win was the Falcons first win over the Cougars in seven years. Lund posted 26 points in three games last week, including a 10-point game against Redondo Union (Calif.) on March 15. Through six games the senior has 50 points on 25 goals and 25 assists. The Player of the Year candidate made 13 saves in the Crusaders first two wins of the season, including a 10-save game in a 9-6 win over defending San Diego CIF champion Poway (Calif.) on Thursday. Shilling scored four goals as the Lakers defeated St. Andrew’s (Fla.) 11-7 in a season-opening win. Shilling is a Johns Hopkins commit. Voelker dished out seven assists in a 14-6 win over Marvin Ridge (Waxhaw, N.C.) on March 14. The senior has 35 assists in five games this season. He followed that up with four assists and two goals against South Mecklenburg (Charlotte, N.C.) on March 16.